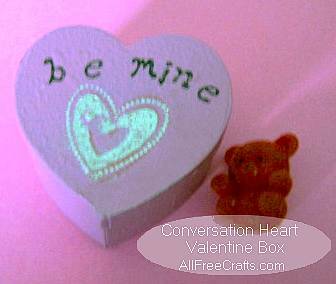 Even younger kids can make these conversation heart boxes to give as Valentines or present to mom on Mother’s Day. The supplies are inexpensive and the project is fun and easy to do. Supplies you will need to make the Conversation Heart Gift Boxes. 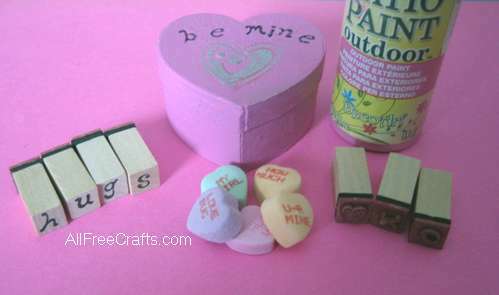 Use a foam or regular paint brush to paint the heart-shaped boxes. You will need two or three coats of paint and time to let the paint dry between coats. Luckily, craft paint dries quickly, so this stage shouldn’t take too long. Choose the letters you need from the alphabet stamp set. Short, one- or two-word combinations are the most effective. Some suggestions for sayings: Be Mine, My Girl, My Boy, My Friend, Besties, Best Friends, Hold Me, Kiss Me, One Kiss, Nice Girl, U-R Mine, So Fine, Cutie Pie, My Love, Love Bug, Love You, Hugs, Hugs and Kisses, XOXO. If using, apply a decorative heart motif stamp or a heart sticker near the center of the lid. 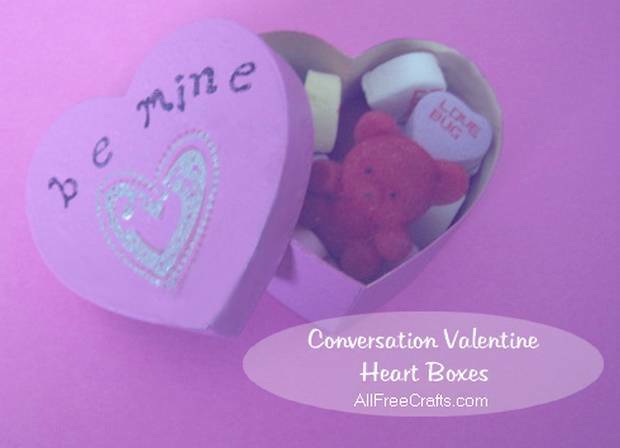 Fill each box with conversation hearts or candy. If you wish, tuck in a miniature red teddy bear or a similar tiny Valentine charm. Paint a heart box for each of the special members of your family or your best friends and put a different personal message on each box for Valentine’s Day.